It’s not all too common I win any sort of award from the sponsor when it comes to contesting. If I pick and chose my class and power, I might have a slim chance at winning some “wallpaper” for the shack. Wallpaper is the ham radio term for awards and after 3 years of contesting my walls are still somewhat bare, but it’s not necessarily about winning for me. It’s about participating and achieving the goals I set prior to any contest. 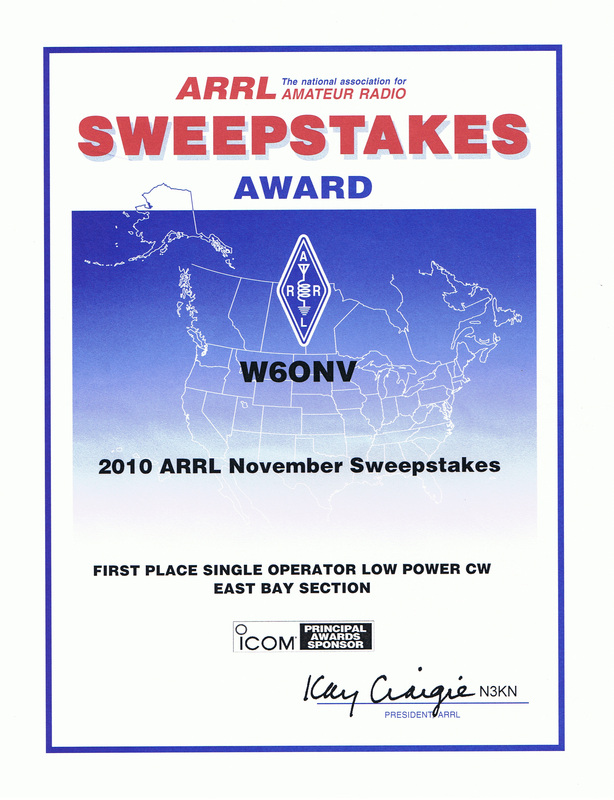 As for as I know this is my second award, the first coming in 2010 participating in the CQWW WPX RTTY Contest I have won participating in a contest. Still it’s exciting to win awards like this and now has me rethinking my strategy for the 2011 Sweepstakes which takes place next month. 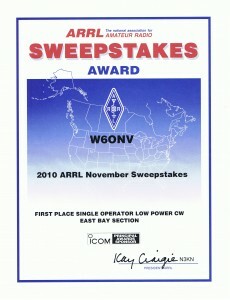 Hopefully I can improve on my 2010 score and duplicate my effort on CW. SOAPBOX: This was my first NA Sprint of any sort I participated in. While I enjoy RTTY, I was not fond of the format of the 4-hour contest. This time around, I had the time (so I thought) and figured I would give the RTTY sprint a shot and see how things went. I had no previous involvement, so I really had nothing to measure my performance on. I could gauge how I was doing by what other contesters were reporting (their number) when we exchanged information. I need to thanks Dean, N6DE for providing macros (for Write Log), but those were easily reformatted for Win-Test. His details and explanation cleared up some of the confusion I had. I am sure all I needed to do was ask any RTTY sprinter and they would have helped as well. With macros set I read and reread the rules of the exchange. Unfortunately some confusion set in when I answered a CQ and exchanged information, receiving a ‘TU’ or ‘QSL’ I would immediately see a station calling without me calling CQ. I came to think this was the “norm” in the sprint format, but it caused me some confusion early on. Speaking of early on, I was about 15 minutes late to the party as I got my UTC mixed and was thinking the sprint began at 1700 PST. So I started on 20M, albeit a bit late and I had a challenge trying to make contacts. I checked the hex beam and I was pointed in the correct direction, but I guess I figured there to be more stations calling or answering CQ. I did read participation was down in a recent sprint. Someone in their soapbox commented it was like being invited to a party, but many people did not show up.So I slugged my way through what was left on 20M, but I could tell see momentary rhythm when things went well. I would call answer a CQ, make the exchange and then call CQ to be answered by a new station. Unfortunately those moments were few and far between on all bands during the sprint. 40M was the stronger of the bands when compared to 80M. I probably should have remained on that band for a longer period, but was still having quite a bit of noise and difficulty making QSOs. It was not really a surprise that 40M was my best bands based solely on the number of QSOs, while 20M was the main band for the multipliers. Unfortunately starting the sprint late, I did miss out on some early QSOs and had to pick up those calls starting on 40M. Every time I contest on 80M I become quite frustrated. The SteppIR BigIR does not have the best radial system, but I found myself yelling at the PC, which did absolutely nothing. I also found I was calling CQ quite a bit up and down the band but rarely got answered. That did nothing to increase my already fleeting confidence that I knew what I was doing. As was said that last hour was LONG and I had to work for most of the QSOs I made on that band. In the end, it was an interesting experience. I now have a baseline from which to build in the next NA Sprint. Not sure I am ready for the CW sprints, but I have a better understanding of how the format goes and what I should expect. While my numbers are not all that impressive when compared to other NCCC #1 team members or other amateurs in the sprint, I did make the (nearly) full 4 hours and most of all had fun, even if I was frustrated and yelling at the computer.